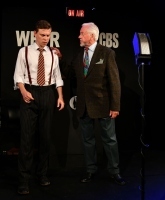 Tim's first performance with Bawds was as Orson Welles in THE WAR OF THE WORLDS: THE PANIC BROADCAST (pictured above) for which he won the 2018 Bawds Golden Plume Award. 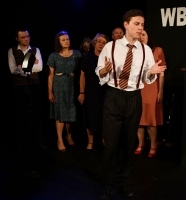 His most recent appearance for the company was as Detective Pete Artridge in the comedy CRIMES AGAINST CHRISTMAS. 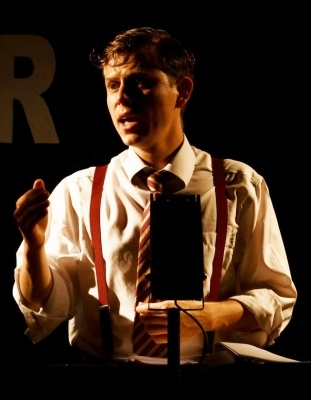 Before moving to Cambridge, Tim had performed in theatrical and musical productions throughout his school and university life. 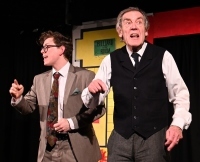 Highlights included performing in a new play at the Oxford Turl Street Arts Festival, and taking a comedy sketch show he had helped write to the 2014 Edinburgh Fringe Festival in connection with the Oxford Revue.